Combined, these benefits can help ensure a good parking experience for employees and patrons, as well as provide a great return on the parking lot investment. Furthermore, a well maintained parking lot with clear markings and signage will decrease the liability of a property owner. IPC utilizes the latest Graco technologies with the Line lazer 5900. 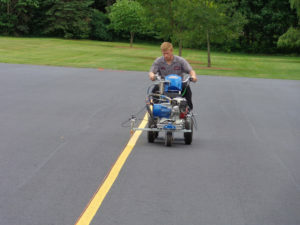 Graco delivers the industry’s first choice for line striping systems, backed by a solid reputation for proven quality, maximum performance and excellent on-the-job productivity. Our machine features a ride on buggy for increased productivity so that we can fly by the competition while delivering the best possible product.